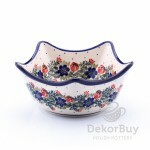 Bolesławiec pottery is renowned for its high quality, handmade decorations and vast spectrum of application. Use it to make your ideas and interior design inspirations come true. Compose your own set in our store! 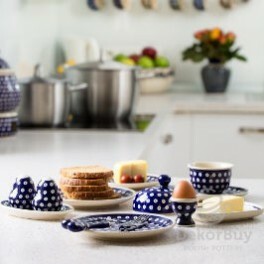 Or perhaps you seek original tableware to make your meals more attractive? A mix of practicality and design? Build your own set: it is as easy and flexible as building with blocks! For years, Bolesławiec has been building its experience in pottery manufacturing. The unquestionable value of the dishes available at our store is their vast selection of patterns, colours, sizes and applications. Add to it competitive pricing and high durability and even the greatest sceptics will be convinced. Moreover, the pottery products offered by DekorBuy can be cleaned in dishwashers and used in microwave ovens and cookers. 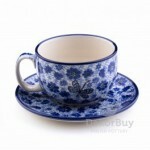 Have we managed to convince you to choose Bolesławiec pottery? How about a set composed of a sugar bowl, teapot with cups and dessert plates? 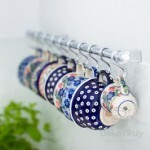 Or perhaps serving dishes, a warmer, spoons and plates? If you still cannot decide, e-mail us, call us or visit our Krakow shop at ul. Sławkowska 11 to meet pottery enthusiasts who will help you make your choice. Visit DekorBuy today to find good value for money.